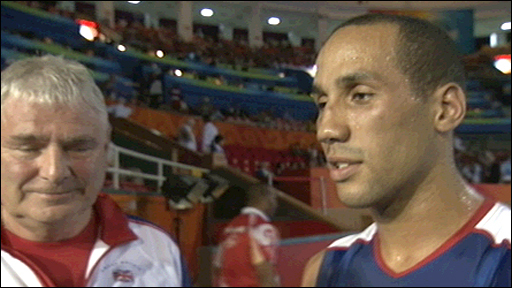 British middleweight James DeGale secured at least a bronze medal by beating Kazakhstan's Bakhtiyar Artayev. The 22-year-old Londoner let fly with a sharp left to land the only scoring punch of a cautious opening round. Working off the back foot, DeGale nicked another point with a lunging right before trading blows and coming out on top 4-1 at the end of round two. DeGale edged the next round to take a four-point lead into the last and boxed with superb control to seal an 8-3 win. It was a stunning performance from the Briton, who never looked in trouble against an opponent who won welterweight gold four years ago and was named the outstanding boxer in Athens. Artayev had also beaten the world number one Matvey Korobov in his opening fight in Beijing. DeGale told BBC Sport: "It was a fantastic win. You have to hit and move in amateur boxing and you will win - and I am good at it. I kept my focus and kept a nice high guard. "I was dreaming about this at home on my couch and now the dream is coming true." DeGale will now go on to fight Ireland's Darren Sutherland in Friday's first semi-final. Sutherland produced an outstanding display to dispatch world silver medallist Alfonso Blanco Parra in their quarter-final. DeGale and Sutherland have met five times before, with the Irishman winning four of the fights and losing only one. But DeGale insisted: "I know I've got a losing record but it'll be different this time. "I'm going to hit and move, not stay static, and combat him right with the tactics. Hopefully now I can go on and win the gold."